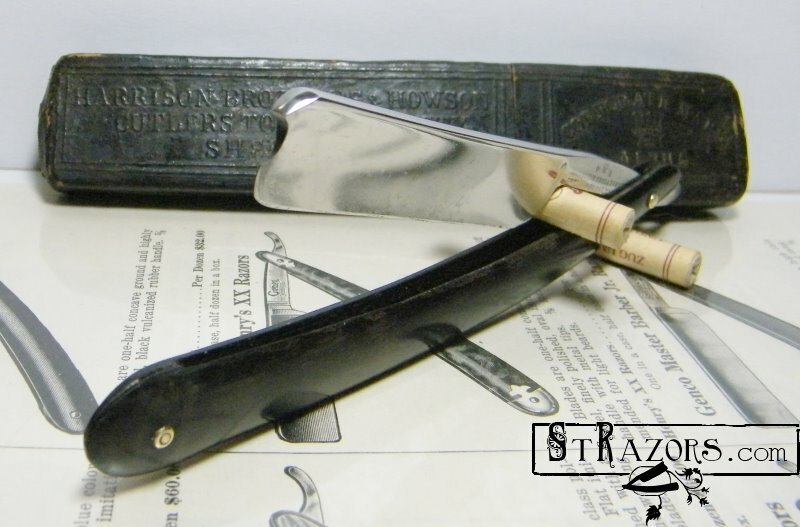 STRAZORS.com - all about classic razors - Harrison Brothers & Howson, Sheffield. Harrison Brothers & Howson, Sheffield. This was one of the biggest cutlery firms in Sheffield by 1900. It originated with George Howson, who was probably apprenticed as a cutler in 1803, and later became a merchant's clerk (and apparently partner) at Thomas Sansom & Sons . He died in Norfolk Street on 9 December 1847, aged 59, but his son William Howson took over his father's interests. In 1849, William partnered two brothers James William Harrison (1816-1897) and Henry Harrison (c.1825-1893)- and the trio took over Sansom and formed Harrison Brothers & Howson. The capital of the business, which was based at No. 45 Norfolk Street, was £7,000. The mother of the Harrisons had once been married to John Brocksopp, a Derbyshire ironmaster, so that linkage helped finance the new venture (Jenkins, 1996). William Howson became traveller for the firm, while Henry Harrison moved to America. The company had agents in New York City during the 1850s and 1880s, including W.C. Corsan. Henry Harrison became Master Cutler in 1862. By 1875, the firm's capital had increased to £75,000. In that year. William Howson resigned from the partnership. He died on 5 July 1884, aged 62, at Tapton Park - his substantial house in Ranmoor (Warr, 2009). The funeral was at Fulwood Church. "At their cutlery works three hundred men are in constant work. On the first floor of this building are the offices - large, handsome and well-appointed rooms; adjoining is a heavily stocked showroom, where ivory stock of every description is exhibited; near this is another showroom devoted to the display of butchers' and other knives, carvers and forks to match, and smaller knives of chaste design and wonderfully fine and careful finish. These goods are packed in handsome plush cases, and from this room are dispatched to various parts of the world, North America and Australia absorbing an immense quantity. Descending from these rooms into a large and spacious yard, we found about twenty forges in operation, two skilled artizans attending to each. At the side of this is the ivory-cutting shop, and underneath the yard are extensive and well-lighted cellars, which are utilized as warehouses for the Egyptian horns and African elephants tusks, which the firm import direct in immense quantities, and which are destined eventually to find their way to the dinner-table in the shape of knife handles. A great point of interest is found here in the powerful steam engine, by means of which the machinery throughout the factory is set in motion. Above the yard are seven shops for the seven different departments into which the manufacture of the products of the factory is divided". By the end of the century, most of the Harrisons had passed out of the business. Henry Harrison retired in 1892 and died in Bath on 20 October 1893 (aged 68). He was buried in Ecclesall. James William Harrison died at Tapton Grange, on 1 March 1897, aged 80, as one of the wealthiest men in the city. He left £239,675 and was buried in Fulwood. Francis (Frank) W. Harrison, the son of Henry, died in Bath on 8 March 1898, aged 38, and was also buried in Ecclesall. He left £61,918. The Howson family then became dominant. George Howson (1851-1930), the son of William had joined the business in 1867 and became partner in 1875 on the retirement of his father. Later Howson partnered Frank W. Harrison and John Brocksopp Wilkinson (1849-1919). George Howson became Master Cutler in 1893. He made two world tours to promote the company's products and his influence was shown in 1896 when the company registered a new silver mark, 'GH'. He was described as 'plain to the point of bluntness in speech and manner, clubbable and characteristically Sheffield' (Derry, 1902). 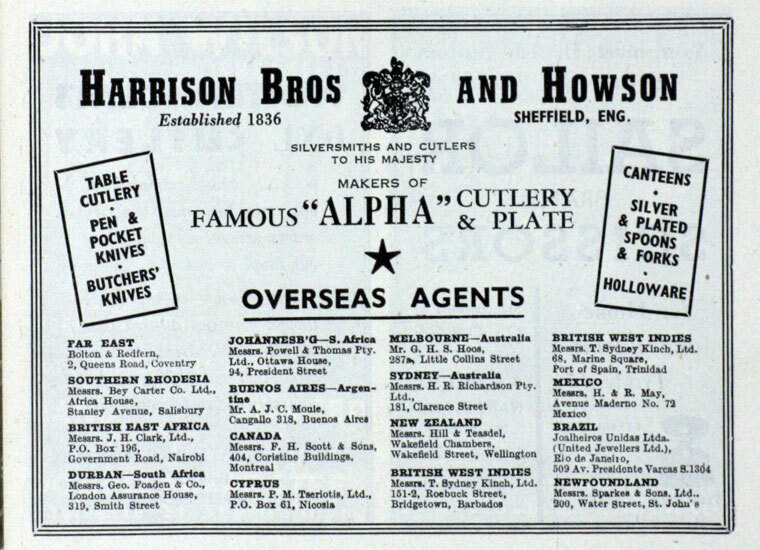 In the 1890s, Harrison Bros & Howson had agencies in New York, at No. 66 West Broadway, and in San Francisco, on Sutter Street. This was despite American cutlery tariffs. The company also had London showrooms at Holborn Viaduct. Yet it never seems to have advertised. Following the purchase of William Webster in 1895, Harrison Bros & Howson apparently employed over 700 hands (Men of the Period, 1896). The Norfolk and Shoreham Street premises became cramped and so the firm relocated in 1900 to a new building fronting Carver Street, and bounded by West and Division Streets. Above the main entrance to Harrison Bros & Howson's Alpha Works (which can still be seen on Carver Street) was the corporate trade mark: a coronet with the word 'ALPHA', which appears to have been granted to either William Sansom or Samuel Harwood in 1836. The firm also used the 'Stag's Head' mark of William Webster. In 1902, Charles Ibbotson, the pocket-knife maker (trade mark, 'SLASH'), was acquired. By now the firm was amongst the top half dozen or so cutlery firms in the city, with a workforce of perhaps about 600 in 1911. In a review of the new premises, The Sheffield Independent, 20 October 1900, contrasted them with the 'shabby, inconvenient, makeshift, sort of premises' that were the norm in Sheffield. George Howson, too, when interviewed by local journalist Fred Callis, shortly after moving into the works, painted a rosy picture. Machinery was turning out barrow loads of blank blades and working conditions had been transformed. 'Half a century ago you did not see', remarked Howson, 'a cutler wearing a collar, and it was most unlikely that he had a Sunday suit' (Cox, 1903). However, although Howson obviously had high hopes for the firm's mechanized future, the expected profits did not materialize. He communicated to a government inquiry (House of Commons, Departmental Committee on the Truck Acts, 1908) that: 'there was not only no profit, but there was a distinct loss on having built that new factory, [and] that if he had employed outworkers and built no workshops he would have been better off than with the factory'. The First World War gave Harrison Brothers & Howson little opportunity to recoup its outlay. The firm declined steadily between the wars. George Howson was still nominal head of this privately-owned company, when he died at Tapton Park on 13 December 1930. He was buried in Fulwood, leaving £37,851. The management passed to other members of the Howson family. In the 1950s, the partners (besides Colonel E.W. Wilkinson) were Brevet-Colonel William Howson and Brigadier Harold George Howson. The latter died on 13 April 1958, aged 66, at his residence North House, Carlton-in-Lindrick, and was buried at St John's Church, Carlton (Quality, April 1959). In the following year, the company was bought by Viners. "An admirable illustration of what has been said is furnished by the history of the firm of Messrs. Harrison Brothers and Howson. Their business was established over a century ago by Thomas Sansoni and Sons, and in 1847 it was purchased by Messrs. J. W. Harrison, H. Harrison, and W. Howson. In that year the cutlery trade was so depressed that the workmen were glad to sweep the streets for a living. A change came, and the new firm began to prosper. Their premises in Norfolk Street were extended again and again ; additional works were acquired in another part of the City; and still more accommodation was needed. Some six years ago the firm purchased property in Carver Street covering about an acre of ground, and thereon they have erected a thoroughly up to-date manufactory replete with all modern appliances and conveniences. The internal arrangements are as complete as skill and long experience could suggest. A prominent feature of the new works is the power-house with its engine of 250 h.p. ; its powerful dynamos, and its motors scattered through the place, furnishing alike force and light. The firm employ about seven hundred people. The progress made by this firm is typical of that of others mentioned. Mr. George Howson, the senior partner of the firm, was asked what, in his opinion, had been the effect of Free Trade upon the cutlery industry of the City. He replied that the trade had more than held its own in face of the high tariffs and keen competition of other nations. There had been progress in the output of high-class goods in the last fifty years, but not by any means to the same extent as in medium and common qualities. This was probably to be attributed to the introduction and free use of machinery which lent itself with more satisfactory results to the production of the lower than to the higher grade wares. Best table cutlery is made now after very much the same methods as it was a century ago, and there is little probability of change, as it is not an article that lends itself to alteration. High-class steel is so hard that attempts to manipulate it by machinery break the tools, and heating it to make it work easily would destroy its temper and reduce it to common steel. For the production of medium and common goods machinery is most valuable — indeed, a necessity of the times. While a forger is making a handful of blades, a machine will turn out a barrow full. Coming to the position of the worker, Mr. Howson compared it with what it was in 1847, when his father commenced business, and stated that not only in money wages, but also in the conditions under which the workman does his work, and indeed in all directions, there has been distinct improvement. The introduction of the emery wheel has relieved the cutler of much exhausting labour. " Half a century ago you did not see," remarked Mr. Howson, '^ a cutler wearing a collar, and it was most unlikely that he had a Sunday suit. I have heard my father speak of one workman of his earlier days, an ivory cutler, who was known as ^ Ivory Bob.' He was dubbed 'the gentleman of the firm ' because he wore a collar and a top-hat 1 You may take it generally that the workman now is twice as well off as were his forefathers." Mr. Howson spoke most approvingly of the working of the Factory Acts and of the judicious manner in which they have been administered in Sheftteld".